Summit Commercial brings unique appliance choices to ADA compliant settings with a new line of commercial beer dispensers made in Europe. Sized at 32 inches high, the SBC58BBIADA is designed to fit under lower ADA compliant counters. The front-breathing design allows built-in installation, while the fully finished black cabinet also enables freestanding use. This unit features a user-reversible 304 grade stainless steel wrapped door complete with a stainless steel handle mounted horizontally for a modern look. We include a guard rail (ships uninstalled) and removable two-piece stainless steel drip tray for cleaner service. The SBC58BBIADA ships with a complete Sankey American dual tap kit complete with a draft tower, regulator, 5 lb. CO2 tank, and all the equipment you need to serve beer on tap. Inside, the SBC58BBIADA is designed to hold two 1/6 (sixtel)  kegs or one tall quarter keg (note: interior does not accommodate a standard half barrel). Automatic defrost ensures easy user maintenance, with a seamless interior for easier cleaning. The stainless steel floor offers added durability when loading kegs. This unit includes an interior light with an on/off rocker switch and a dial thermostat for easy and intuitive temperature management. A CO2 tank bracket is located inside, allowing you to keep the tank inside and save on exterior depth. The SBC58BBIADA is ETL-S listed to NSF-7 commercial standards. 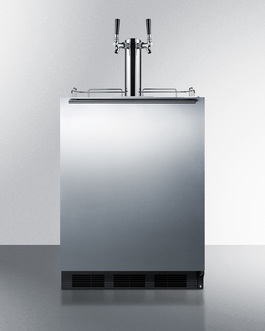 Additional ADA compliant kegerator choices are available with panel-ready or glass doors. Browse our complete line for more choices.